I didn’t know much about Mt. 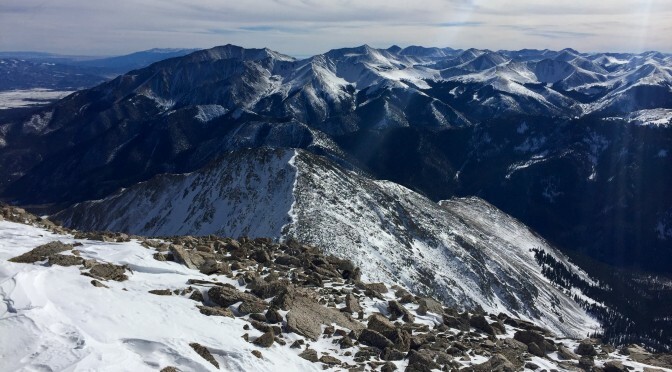 Yale winter climb; it was without question the least researched 14er to date for me. While I had done overkill research for most peaks, I really decided to do this peak last night, realizing I was just down the road from the trailhead and the road was paved and plowed the whole way. After getting stuck for nearly 24 hours on the road to Mt. Sherman, I was committed to either purchasing new tires or sticking to the tamer trailheads for now. I figured the tire stores would be closed for the weekend so figured I’d attempt a three summits in three days with Sherman yesterday, Yale today, and La Plata tomorrow. I hit the trailhead a little after 9am with warm temperatures and a snowshoe-packed trail. Snowmobilers had been rounding up in the parking lot and I was happy to escape the hundreds of roaring engines for the peaceful woods up the trail. The hiking was easy, disconcertingly so. I knew I had over 4000 feet of elevation to gain and would rather it be spread out as much as possible over the 5 miles to the summit. Instead it was looking like it would kick up above treeline. I had read that a Mt. 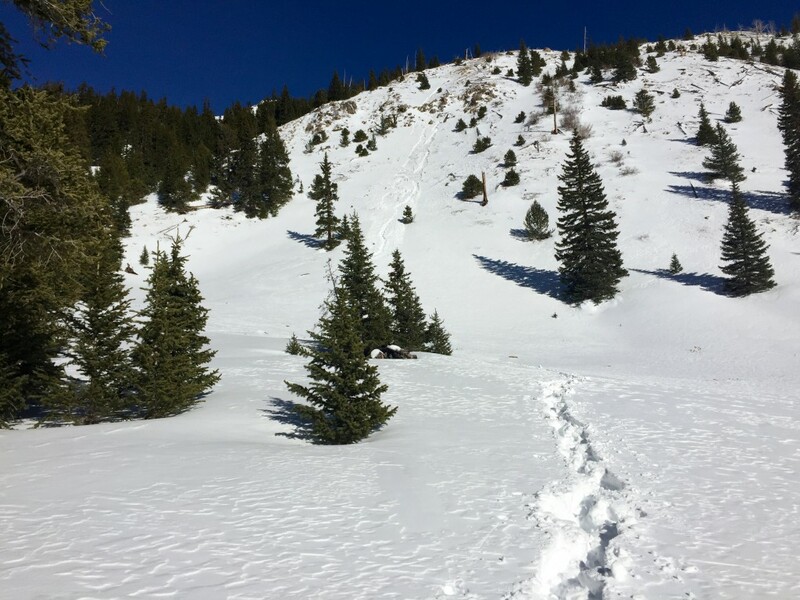 Yale winter climb was a nightmare to navigate and just below treeline I learned why that is. A network of crisscrossing tracks peel off left and right and there’s no way to know which one is the actual trail without having hiked it extensively in the summer. So I chose to follow the one that appeared the most travelled and found myself bushwhacking up a 35 degree slope. Most of the tracks stopped and turned around, but I saw another hiker up the trail through the thick brush so I kept moving. He wasn’t breaking trail but he was obviously the first hiker on this particular path of that day. I passed him on the steep slope and wished him a good climb. We both continued on that path until treeline where I chose to ascend straight up the ridge to get a better view. To my surprise it wasn’t a ridge at all and the towering summit came into view just beyond it. 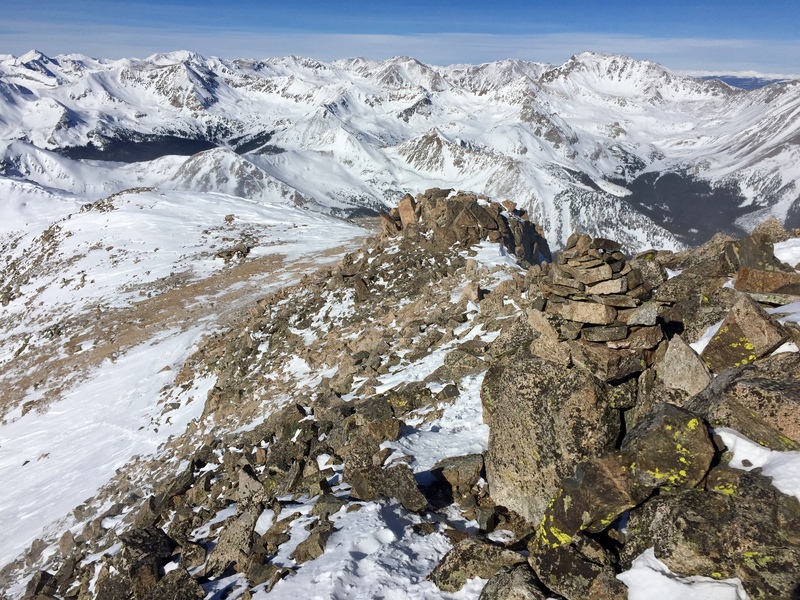 The windswept slopes above treeline were a welcome treat and I quickly headed directly for the summit. Other climbers were scattered ahead, the orange and red jackets visible in the distance. Still not seeing a trail, I set my sights on the highest climber and aimed straight for him, with the other guys winding all over, struggling to find a distinct trail below the scattered snowfields. Soon I caught the guys and we enjoyed talking about the crazy ways we had all come up the mountain. It was five of them, two pairs and one other solo. The last kick to gain the summit ridge is super steep and you either pick a line up the snowfield off to the right or the rocks off to the left. 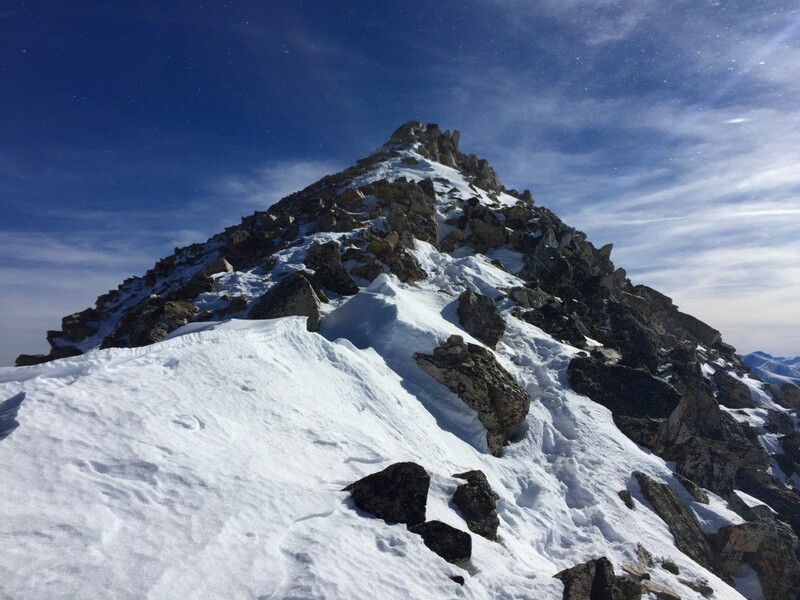 I scrambled between the two, uncomfortable with the idea of kicking off a stone at the guys below, and fearing a fall on the slick snowfield without my axe. 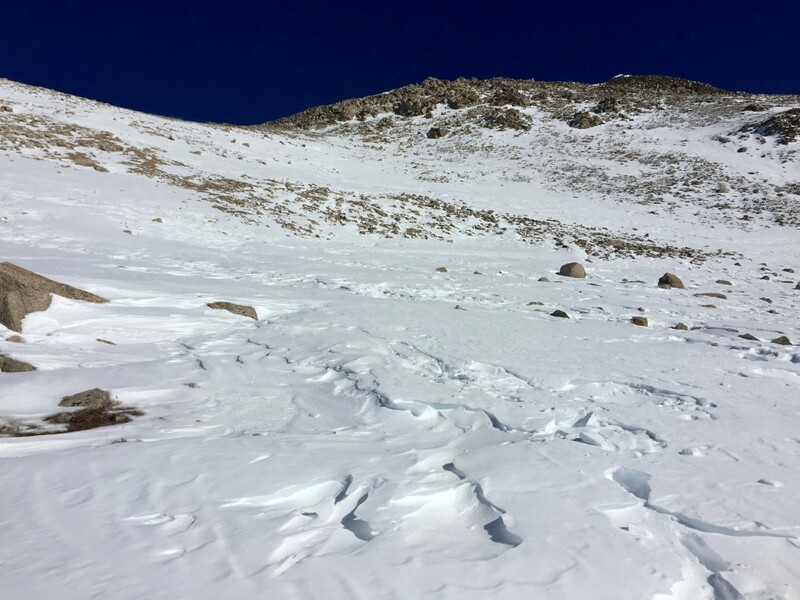 The wind went from a comfortable breeze at the base to a steady blast up on the summit ridge and I put on my shell jacket and balaclava to protect my nose from some minor but uncomfortable frostbite I had obtained on Pikes Peak three days earlier. Another climber, the one who apparently had been exhaustingly breaking trail since 7am, still with tremendous amounts of energy come plowing up the slope and caught me as I bundled up. His enthusiasm for the peak was awesomely contagious and we summited together at 12:30. 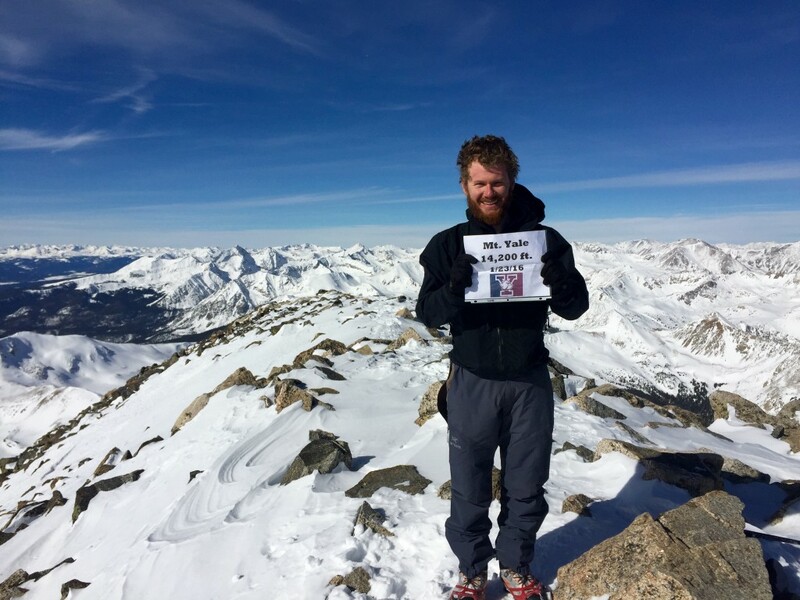 A friend of his who had climbed Yale a few days earlier had asked him to look for his lost Microspike on the summit. I looked down at my feet as we meandered about and saw a red rubber loop peeking out of the snow. I reached down and stuck a bare finger under the loop, and pulled up a single Microspike. We were both super stoked to come across it and I passed it off for him to return to his friend when he made it back home. The wind on the summit was mild compared to down lower on the ridge and we caught some summit pics and had a snack while he waited for his friend to catch up. I enjoyed the summit for nearly an hour as the other guys worked their way up. By the time I was warmed and fueled up and getting ready to head back down there were six of us scattered along the summit ridge. The ridge is a narrow scramble where the consequences are absolutely dire with the slightest slip. Some of the snow made for a little bit larger of a platform to traverse along but I still had concern that some of them could snap off into empty space with the next step. 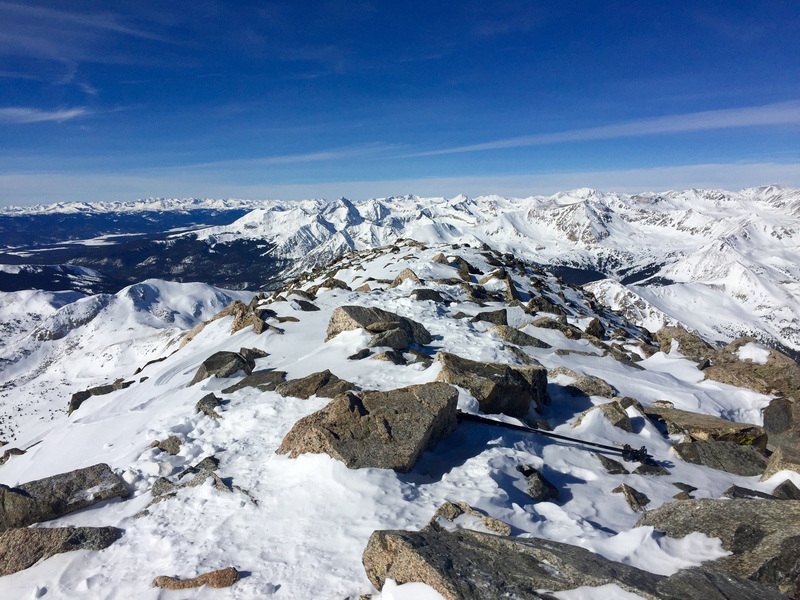 I took my time, appreciating the incredible clear skies and warm temperatures to enjoy the views of the thirty 14ers visible from the summit. Off the ridge I glissaded down the snowfield jabbing the handles of my trekking poles into the snow to slow myself down and in the process ripping up some new poles I had picked up just days earlier. I opted for a different line down, a mistake I’ve made before and I am certain to make again. But I figured I would hunt for the actual trail and deciding we had cut off to the right too late, decided to head left in hopes of finding an actual path. But instead of the trail I found myself at the top of a steep cliff down into a deep snow-filled bowl. With such steep terrain I figured there was little risk of setting off a slide especially with some of the rocky ribs penetrating through the snow. But just above a steep drop on the slope I started sliding, the sleet-like icy snow coming with me. And with each foot I dropped more and more snow started to come with me. Like a riptide, the recommendation for a narrow avalanche is to go sideways in hopes of getting out. So I jumped and reached for the rocks and static snow off to my right. This was a small enough slide that it was easy enough to get off and I managed to shock load a basketball size stone sticking out of the ground and stop myself before going over the edge. This was a tiny slide but scary enough to instill in me even more respect for the daunting amounts of snow on some of these mountains. After catching my breath from the incident, I worked my way around the drop off and descended down toward the bowl. Down in the valley the snow was deep and soft and my snowshoes pierced through like bare boots. 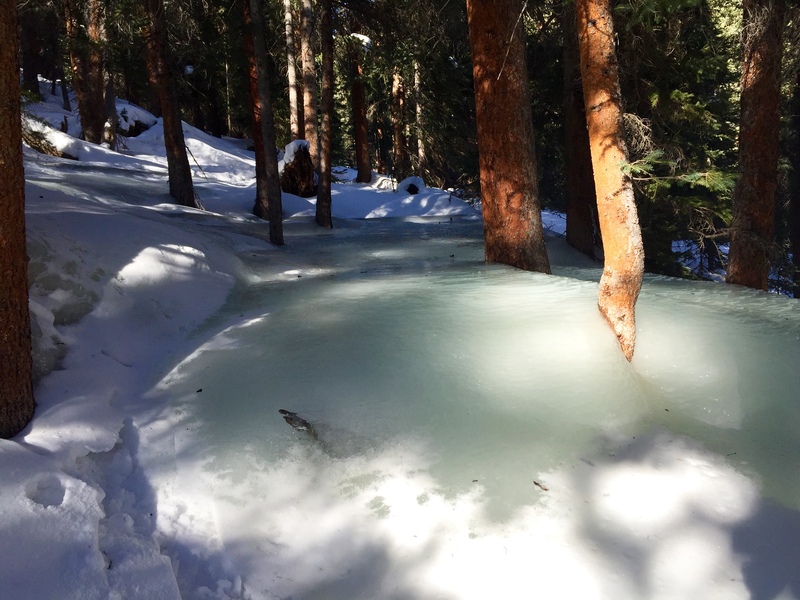 I crawled through snow up to my waist toward where I knew the trail should be, just a couple hundred yards away. But with this slow moving I was sure that someone else coming down would catch and overtake me, laughing at my “shortcut”. After stumbling over downed trees and a rotten log over the creek I made it back to the trail and to my surprise found only the remains of my snowshoe tracks heading up the trail. My tracks were easy to spot with the front point of my snowshoe snapped off on my right foot from a misstep from descending Evans a couple weeks ago. I enjoyed the packed trail back to the trailhead and arrived back at my car a little before 3:30. But with all the snowmobilers arriving after their day’s ride, I was quick to pack up and get out of the parking lot. Another epic day, I was happy to bag a Mt. 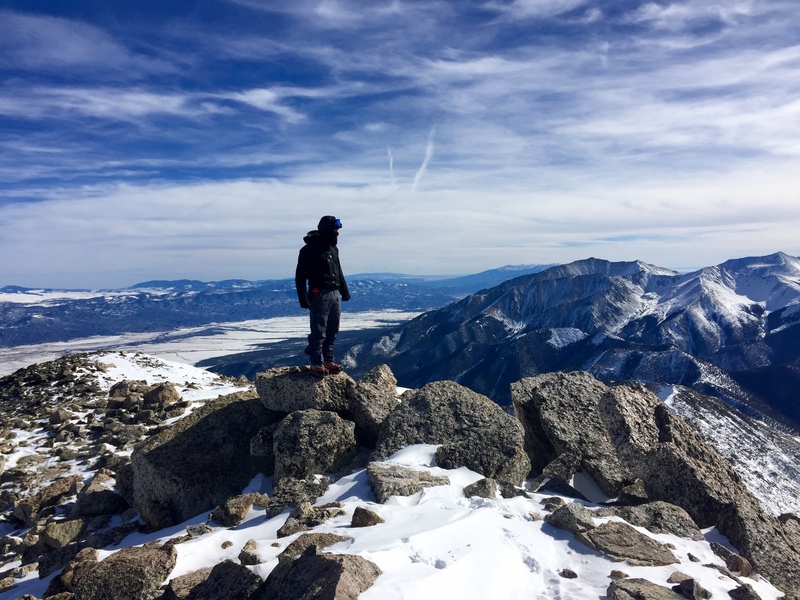 Yale winter summit and knock out 14er number 17.